On July 18, 2016, U.K. runner Robbie Britton informed the world via social media that the International Association of Athletics Federations (IAAF) had purportedly suspended Gonzalo Calisto, of Ecuador, for a positive in-competition drug test at the 2015 UTMB, where he finished in fifth place. Multiple documents available that day on the IAAF website confirmed this fact. While we have seen a couple doping sanctions in the years iRunFar has followed trail and ultrarunning, this is the first incidence that the community has taken special interest in and made significant comment about in the ‘heat of the moment,’ as information initially becomes available. Over the past two weeks, more information has become available from the IAAF, UTMB, the International Trail Running Association (ITRA), and Gonzalo Calisto himself. As such, though it has taken some time, much is now publicly known about Gonzalo Calisto’s story with more likely to become known in the future. This article attempts to lay out the facts of what is known about Calisto’s case and to make all the publicly available information easily accessible. In the first part of the article, we summarize known facts into a timeline. In the second part of the article, we collect all of the public documents currently available regarding Gonzalo Calisto’s case. We will update this article as new information becomes available. May 30, 2015: The 2015 IAU Trail World Championships takes place. Gonzalo Calisto competes and places 21st. August 28-29, 2015: The 2015 UTMB takes place from Chamonix, France. Gonzalo Calisto competes and finishes fifth. July 18, 2016: U.K. runner Robbie Britton makes several social-media posts about IAAF’s suspension of Gonzalo Calisto as a result of a positive in-competition drug test at the 2015 UTMB. iRunFar tweets about the information publicly available on the IAAF website, and writes the UTMB race organization requesting a statement. Additionally, the IAAF maintains a list of currently-sanctioned-by-the-IAAF-for-doping-violations on its website. It appears that the IAAF regularly updates this list. The current list can be downloaded from this page under the “Sanctioned Athletes” header. I am not a professional runner, I’m an amateur with dreams that strengthen my motivation for adventure. Simple life experiences in nature are my day to day goal, every training, and every competition. I’ve never raced for awards, recognition, or even less for money. During these 13 years full of adventure sports I’ve filled my spirit with experiences and learning, and I’ve been lucky to be able to share them with many generations of adventurers of the country. During this period I could see the exponential growing of Trail Running around the world, a sport that captures thousands of fans in my country in countless events. I’ve always felt fascination for the mountains, especially for higher ones; that’s the place where I’ve learned to run, to go up and down, walking and running, pushing myself and discovering how the strength of the mountains transfers to our body and spirit. Due to its geographic position, Ecuador has mountains of different heights around its capitol city Quito (which is located around 3,000 meters above sea level), with different types of terrains and changing weather, which makes it a perfect place for outdoor activities. Sport events are usually held in mountain zones of the Andes region, and are events that go from 3,000 to 4,500 meters above sea level, which allows our bodies to adapt to these extreme conditions by the natural production of erythropoietin (EPO), and to our blood to be more thick to oxygenate our body, what doesn’t happen at sea level, where oxygenation is optimal. This has been scientifically proven and it is used by many athletes to improve performance; it’s called altitude training and it’s a natural process. At a national level in Ecuador, Trail Running is not registered as a sport. It’s not regulated by any federation and it’s not under any ministry. All events are private and there are no licenses to compete, neither any standard rules. At an international level, Trail Running is endorsed by the athletics federations of different countries and athletes have a local ranking, in order to participate in some important or prestigious events, and in an elite category they are asked for the licenses given by their federations, with the final purpose of guaranteeing the sport protocols between runners and event organizers. 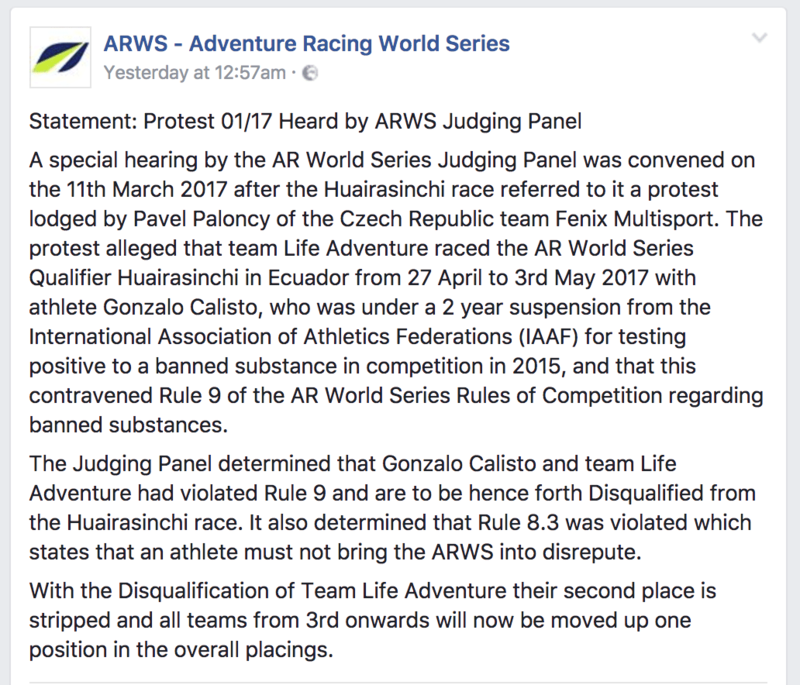 IAAF is the regulator of elite athletics worldwide; they organize an ultra trail world championship, but they don’t endorse other competitions of trail running around the world, as they are not considered big events as Olympic games, Panamerican games; so, UTMB is not under their endorsed races list. AFLD, French Anti-Doping Agency, is in charge of regulating anti-doping tests in French events. ITRA, International Trail Running Association, is an organization that proposes a ranking through a performance index according to race results. EPO, Erythropoietin hormone, in charge of increasing blood density, it’s naturally secreted in the body in hypoxia situations (extreme altitude). It’s the most prestigious long-distance race in the world around Mont Blanc. It’s a private race, with no prize money, that gathers 2,500 runners from all around the world, 300 of them qualified as elites or professionals, it has its own rules with its own qualification system, based on points given by other races they endorse. During the UTMB event they made an anti-doping test on me, before the start and after finishing the race. The result of this test showed an adverse result, reported as the presence of EPO, without specifying what kind of EPO was found and to what levels. The AFLD was in charge of doing such tests and to report my case to the IAAF; I was never able to check the exact results, even though I asked for them. Although being an entity that regulates professional sports, the IAAF has made these results public, without taking into count that I am not a professional runner as I don’t own an athlete license and that I’ve never belonged to a federation, which makes my addition to their ineligible athletes list inconsistent, as they don’t have the jurisdiction to sanction me. The UTMB organization didn’t have information about this case until it was made public via social media, which demonstrates the lack of interaction between these two organizations. The positive test should have been analyzed in a B test to ratify the presence of the specific substance and their levels to certificate it’s a real positive and not a false positive. This process is usually requested by the entity that regulates and endorses the athlete, in this case, the issuer of the license. In my case, as I don’t have a license, the UTMB organization had to make me sign a provisional license that allowed me to race in the elite category, a document I’ve never signed; besides they should have certified that I understood all the protocols of a professional athlete, information I could never reach. In this case, I was left with no legal neither federation or ministry support, and to appeal this result, I had to take care of all the legal expenses of the process, an unaffordable cost for me, considering my condition of an Ecuadorian person against an international body in France. By this, I’m trying to highlight that the legal platform used to judge and sentence my case is insufficient, as it doesn’t count with the synchrony of the regulating bodies, the organizers and their rules to apply the regulations regarding non-federated amateur athletes, without federative licenses; with this I mean, amateur athletes who personally cover the fees of our hobbies. Because of everything I exposed in the previous paragraphs, I wasn’t able to apply my right of defense, a known right in all legal systems of the world. We should demand in our country that the Ecuador Athletics Federation registers Trail Running as a sport, issues licenses to high-performance athletes that aspire to compete in international events, and that endorses the main trail running events in the country, giving information regarding doping, forbidden substances, and international-competition protocols. Establishing a ranking system in which runners are divided in the diverse categories. Regarding an international platform, there should be established parameters that are compatible between the prestigious trail-event organizers and the regulating entities of the sport, give better information and election of the athletes to guarantee they are eligible to the category in which they are going to participate, in order to get clear information about the competition protocols and their respective anti-doping regulations. I’m in favor of anti-doping controls, I like fair play, I’ve never voluntarily used performance-enhancing substances, but we have to be coherent regarding the realities of the athletes, especially in this kind of sports where there are not international regulations, so there can be a safe and loyal platform to practice high-performance sports. I ask myself, are the used anti-doping controls sensitive? Do they take into count the athlete’s genetic traits? Where they come from, how they train, and how they eat? Is it reasonable to judge an athlete that has no license, that takes no profit of the sport in the elite world in the same way as a professional athlete does, living and taking profit with the sport? Is it fair to make anti-doping tests without a legal platform that allows transparency to judge sports and events? Surely my case is the first one with these particularities; I’m not professional, I don’t have a license, I live and train between 3,000 and 5,000 meters above sea level, I have high blood levels, I made a top-five rank in a race where professional athletes from Europe compete for the podium with clear knowledge of the rules. I went to the controls without knowing or understanding the protocols in high-level competition. I don’t have the legal support of a professional license neither the backup of a federation and I consider the processes in which I was tested and sanctioned not equitable, impartial, or transparent. There are legal platforms in other sports where these characteristics are stipulated, as it’s the case of the IronMan platform, in whose rules the athlete condition is taken into count (being amateur or professional) to avoid these polemic cases due to lack of rules structure and lack of clear information of these processes. Why was my case reported by the IAAF and the UTMB organization had no idea about it? Why are the IAAF, AFLD, and UTMB rules not compatible in the process of a positive test in an amateur athlete? Under whose authority or jurisdiction does the IAAF ban me for two years, if I’m not a federated athlete? Why does UTMB not have a special registration system for professional athletes? Why is UTMB not registered under IAAF endorsement? Why was I allowed to participate without a license in a category where they make controls that require a license? I aspire that my case is useful to clarify and modify the regulations of Trail Running at a worldwide level. Obviously this is a sensitive topic. We believe that civil conversation by the community can play a large and important part of minimizing cheating–including doping–in trail and ultrarunning by creating a culture that is intolerant of it. As such, we welcome you to constructively talk with each other in the comments section of this article, but we also implore you to do so according to iRunFar’s comment policy. In advance, thank you. Curious why the B sample wasn’t retested? That seems to be normal protocol in the T & F world. He seems to have some decent points. A few times he does seem to be pleading ignorance, which never seems to help a case. I’m afraid my answer will be long and potentially confusing, as I am so much a newbie in understanding international anti-doping regulations and regulation enactment. Sorry in advance! So there is WADA, the World Anti-Doping Agency, and they have a code which governs all aspects of doping testing, laboratory analysis, sanctioning, dispersal of public information, appeal, and more. Around the world there are hundreds of signatories to the code, agencies who have agreed to operate by it. The French Anti-Doping Agency (AFLD) and IAAF, which are the entities that are apparently handling Calisto’s case, are both WADA code signatories. So, in theory, their procedures should follow WADA’s code. The code is available online–it’s massive–and the WADA website also provides download materials that help interpret/understand the code. What we have arrived at now, where we as the public have access to a limited amount of information about Calisto’s case, is well past the potential window for testing his B sample. In theory, this is what’s already happened at this point, according to the code: A sample comes back with positive test at the lab. The lab informs the organization handling the case in a certain time window. The organization informs the athlete in a certain way and in a certain window of time. The athlete’s options in response to being informed of an A sample positive test include requesting that a B sample be tested and being present for the testing. An athlete can do this, or they can have a designated support team do this. Also, the organization handling the case can also request B sample testing, even if the athlete doesn’t. There is a window of time in which this request can be made–which the athlete is informed of–and a window of time in which the B sample needs to be tested. After an athlete is informed that his/her sample(s) have been found to test positive for a prohibited substance, he/she also has a right to a hearing if he/she requests it in the designated window of time. Again, an athlete can request this or their designated support team can. After all this, a decision is made by the organization handling the case, and the athlete is informed of the decision. Certain pieces of information from the case are made public, by the posting of the results to the organization’s website. Even once a decision has been made (where we are in the Calisto case), an athlete has a right to appeal the decision, and there’s a whole appeals process governed by the code. If Calisto’s case has been handled according to the code, he’s already had the opportunity to request that his B sample be tested and he was told the way in which he needed to do that and the window of time he had to do so. If I understand Calisto’s claim correctly, he says he did not have a supporting federation to request his B sample testing. The code, however, makes very clear that the athlete can request their B sample be tested and that they can actually be present as it’s happening. Obviously what we now have is a he said, she said situation. Because of code confidentiality regulations, I don’t believe the public can have access to any more information via the organizations managing Calisto’s case than what we already know–unless there are significant changes to his suspension like a shortening or cancellation. However, Calisto could choose to publish more materials from his case and we could find out what actually happened during the window of time in which his B sample could have been/was tested. Meghan, truly appreciate you taking the time responding to this. I’m trying to wrap my head around this as well. Thank you iRun Far for your coverage of this! In my opinion I think transparency (at all levels) from the runners, media, sponsors, race RDs and governing bodies is key. Testing is for sure very limited due to mirodosing, but perhaps more of this kind of discussion and coverage about the issue will discourage future PED use in the sport. Probably already a fair amount of PED users in ultra’s and i don’t mean at elite level. A lot of mid pack middle aged cyclist’s take them and as this sport grows so will the number PED takers – educating runners on the dangers is best option for dealing with the guys. I know Race Director’s say testing is expensive at present and the answer to that is REALLY SIMPLE. In nearly all of the major races the Top 3 finisher’s are sponsored pro/semi pro athletes. North Face/Salomon/Nike etc are all over these events when their guys are running them they should easily be able to pay for bio passports/race tests if their guys are on he podium. In fact these companies should have a rule of No bio passport No sponsorship deal. I have heard a whisper about at least one major sponsor of trail running looking to make moves in the sort of direction you describe-=. I think if one major sponsor did this, there would be impetus for the other couple big brands to follow suit. A great idea all around, in my opinion. As I understand it, there’s a lot of legal research and writing that has to get done in order to make this sort of thing happen. And we have athletes who have already signed into the language of multi-year contracts. So, the time scale at which we might see this might not be a swift as we’d like it to be, but I have the feeling we’ll see someone start making moves in this direction soon. Thanks for the detailed discussion of the case and for providing many of the primary documents. I think in all of these cases transparency is critical. Personally, I am concerned that doping is very widespread among many ultra runners, but honestly I really have no idea. I do strongly believe in the presumption of innocence, and Gonzalo Calisto raises some concerns that are very troubling. For example, based on my understanding, Gonzalo may have never have been informed of the specific test results, ” The result of this test showed an adverse result, reported as the presence of EPO, without specifying what kind of EPO was found and to what levels.” It seems crazy to me that sanctions could be issued without detailing and publicly reporting the specific findings of the test, along with supporting findings from a second test (B sample), along with the margin of error of the tests. I also wanted to echo Wayne’s comments above and voice my respect for Sage in posting his blood results and working to promote transparency. As I mentioned in a previous comment, the place we’re at with Gonzalo Calisto’s case is that of he said, she said. While Calisto is claiming he hasn’t received his laboratory results, if I understand correctly, WADA code describes that, in the documentation he received from the organizations handling his case informing him of his positive test result, there should have been instructions stating he had a right to request laboratory documentation and how to do it. In my comment last evening to Joshua C, I wrote about the WADA code that the AFLD and IAAF are both signatories to–meaning they operate by the code–and how the code standardizes every aspect of anti-doping testing. The WADA code and its supporting documents (in this case WADA Technical Document – TD2009LDOC, I believe) governs that an athlete be told exactly how to request lab results and their right to them when they are informed of their positive test result. And the code and supporting documents also regulate exactly what details the athlete receives in their lab report. Every athlete who comes back with a positive test result for a prohibited substance should get the same pieces of information in the documentation from the lab that has analyzed their samples–if they request it. It’s my understanding from reading the technical document that a lot of details are included in a lab report. I know that it is possible to determine the difference between natural and exogenous testosterone. It’s a more expensive test based on differences in the way the protein molecule is actually folded. That is what slammed the door on the Floyd Landis case. There was a new form of epo, I believe it was called Cera, introduced a few years ago. The manufacturer added a marker so it could be easily detected in tests without telling anyone. A bunch of cyclists were nailed with that one. I don’t know if EPO has a marker or way to distinguish natural, from unnatural EPO. It would be be interesting to find out and if not, ask why there is not one. I do know that the effects of living at altitude are real. Ive lived between 6k and 8k elevation for the past 20 years. My hematocrit ranges between 49 and 52. I would be ineligible to start a pro-cycling race more than half the time even though I am slow as molasses. Technical Document – TD2014EPO. My understanding of EPO testing is certifiably fledgling, but it appears that, yes, there are multiple tests currently used by WADA-certified labs that differentiate between endogenous EPO and ‘synthetic’ forms of EPO and similar chemicals. I also read a journalistic article about WADA being in a testing phase for a new test that helps to detect genetic EPO doping. What I gathered from the article is that there is thought that some athletes may be starting to dope via DNA injections that supposedly increase natural EPO production in the body. Thanks for your input Michael! I believe you are talking about the carbon isotope test? Which I believe is a game-changer as even if one’s ratios are “normal” it detects synthetic testosterone still?….it got Boulder cyclist Tom Danielson as well. Might as well test for HGH also while we’re at it. For those referencing my blood test results: thanks for the support! – I try to be as transparent as I can (i.e. with that and even Strava training etc.) However, I’ll admit a basic CBC blood test (or even a race-day drug test) doesn’t prove anything besides that I’m not tripping a super high hematocrit at that moment in the time. [For the record I am 100% clean…test me anytime and any place!]. As Michael referenced above, living and training at altitude can boost hematocrit a bit. Right now (as of two days ago) mine was only 44 (I just submitted a voluntary ITRA test for their public online database)…but after living and training in Ned (8600′-10,000) for 3 months a few years ago I got mine up to 47-48 naturally…which was by far the highest I’ve ever been that I know of. In speaking with some others, it appears hematocrit can exceed 50 naturally so the real test is a test that detects synthetic EPO. But again with micro-dosing and all these new designer drugs I think bio passports and surprise, out-of-season tests (ideally in the middle of the night) would probably be the most effective way of actually catching people. Some PEDs seem to be way more advantageous than others, but just the benefit of a quick recovery from super hard training that allows one to build up “super human” strength is probably worth A LOT in race day gains. I want to echo what others have said here. I, too, applaud your choice for transparency with respect to your test results–both the results of your tests for prohibited substances and your regular blood work. And I would encourage other athletes to do the same. This is the kind of ‘cultural evolution’ that I think would be really good for the sport. Hey thanks Meghan – and congrats on your Hardrock finish! Yes, the the culture/community of MUT Running is very generous and encouraging….ultimately when people use PEDs they are really only cheating themselves. (Also of note: obviously I’m very biased on this whole issue as racing performances are my main “job” and a way to earn a living right now). I’d post urine tests as well if they ever tested me out-of-comp (never happened yet). I freaking love this sport..it’s ingrained in my life and identity and occupation. The MUT running community is so full of honestly and integrity (and respect for others), so it is frustrating to see when some may be using PEDs to gain an unfair advantage and perhaps lie about it. Thank you again for your coverage of this! Is it too simplistic to believe that there is a threshold for hematocrit levels. Back in the Lance days, cycling would suspend you for hematocrit above 50, and some riders were given comical nicknames like “Mr. 60” for having absurd doped hematocrit levels. Without looking into the science myself, I would think that an adequate baseline could be obtained from athletes who live at 11k in Peru, or 10k in the Andes and that would provide a simpler, and much cheaper method of testing on sight at these events. From my limited knowledge, your levels of 47-48 from training really high are about as high as it gets for world class endurance athletes? I could be wrong, but I don’t see this level as being as variable, such as VO2max, among world class athletes. By the way, did they ever say what his hematocrit level was? It just seems very convoluted and expensive to have to test for synthetics. I’m probably very ignorant here, but its frustrating as a fan to see the data come out a year later. Regardless, out of competition testing is where all of the focus needs to be while athletes are reaping the benefits of huge back to back workouts. i believe they did a urine test (looking for EPO variants)….so it wasn’t the blood/hematocrit. In speaking with other runners apparently there are all sorts of people who are naturally over 50 so I guess I’m just pretty average. In my opinion a hematocrit threshold is too basic (although a very cost effective method! )…many more variables involved. Thanks Sage for your continued input on this. It would be wonderful if there was a very simple threshold. I think that the only truly transparent thing to do is what you’re doing. Posting your tests. Unfortunately I have a lot of familiarity with drug testing based on working in the cycling industry for a decade, working for the USOTC, etc. A biological passport system is quite expensive. Professional cycling teams pay tens of thousands of dollars per rider to make those happen which is why they are only used at the Pro Tour level (at least last I knew a few years ago before getting out of the industry for good). That kind of expense is impossible for most mountain/ultra runners to bear, just as it would be for their sponsors (and, which sponsors have to pay what portion of an athlete’s expense for the passport since most runners have a pulled-and-scraped-together sponsorship program and operate outside of formal teams with whom they have a single contract – which is the case with cycling and football/soccer, and other sports where you see the passport used). If Calisto is telling the truth about the timing of events, and nothing else, then his sanction should be tossed. If WADA protocol was followed, then there is no possible way that Calisto is telling the truth about anything that he has said. WADA protocols are very clear that an athlete must be informed of an adverse finding within a certain amount of time (I think it is two weeks, but may be wrong about that), and the athlete himself has the power to demand a B-sample be retested not the federation (and there should be no expense to the athlete for this). Finally, as far as I know, there is no way to ‘accidentally’ take synthetic EPO – sure you can get steriods/hormones in meat, steroids and their precursors in supplements, etc. – but EPO/CERA/etc. must be climate-controlled and injected. There is a direct link between PEDs and financial benefit for the user at the elite-end of sports. Fortunately, mountain/ultra running pays rubbish and there is little financial incentive to risk your health, reputation, etc. to purchase very expensive drugs in order to cheat in a way that actually “benefits” you. Having seen sports ruined by doping (cycling, triathlon, distance running, track & field, etc.) I can only hope that mountain/ultra running stays niche and avoids this same fate. To me, it would be much worse than what happened in any of those other sports, because mountain running should really be about your relationship with nature more than anything else and doping to “succeed” is the greatest failure that I can imagine. On the amateur side, it’s much murkier, even sinister – it is something that I cannot even conceive of. As an amateur cyclist/triathlete/runner in my 20s I would avoid using even approved/prescribed inhalers around a race (I have diagnosed asthma) because I didn’t feel it was fair to have an advantage over what my own body was physically capable of. If I finished a race and needed my inhaler I would use it, but not before or during competition. To me, that is the ethos that trail running instills – it is me, out in the mountains, testing myself and giving my best. If I come up short there is no shame. If I am successful, there is no glory either – simply the knowledge that on a day I had a good run, which is satisfaction enough. As an amateur to dope is not only to cheat others, but to nullify the entire point of your pursuit. What will happen in the sport? Who knows. Money could absolutely ruin it. Becoming the “new version of triathlon” (rich guys bragging about how cool they are because they did X race over the weekend) could ruin it. Plenty of things could ruin it. Hi Lance thanks for your valuable input. I respect your experience in the cycling industry and what you have learned (and written in the above post). In my opinion MUT Running doesn’t pay “rubbish.” At the sponsored level it can be very very rewarding (and lucrative) as it can offer a change in the lifestyle…the ability to travel the world and train full time…that is a dream come true! While it’s not big money cycling or like most other “pro” sports in terms of raw cash prizes/wages, I think the rewards of a top performance are worth quite a bit in terms of sponsorship opportunities, exposure, travel etc. A win at Comrades is worth over $40,000 (that is a lot of money to me!). North American ultras, top ones are $10,000 and $12,000…still a lot of money to me! I knew I guy who raced on the roads who got busted for EPO…he made $500-1500 here and there doing half marathons and 10km races. At the end of the year maybe he made 20k in prize money. He somehow justified it though. I’ll admit that I don’t know the cost of anything though. I’d imagine EPO/HGH is fairly expensive and harder to get. But what about some testosterone patches/cream? a bottle of DHEA from the grocery store? Steroids? Actovegin? Not to speak for Lance, but I think of it as an arms race of the dopers versus the testing labs/authorities. In cycling you need to be fairly sophisticated to beat the tests since the testing regime is relatively complicated — a fair amount of money is spent on both sides. In MUT, relatively little is spent on testing so it would be easier to beat the tests — less money required on the part of the athlete but still more than they likely have. A Comrades win might cover the annual cost of doping for some athletes in other sports. The crazy thing is I believe that there are those that can afford the drug (part time runners with FT jobs) that do dope. Non sponsored. Age groupers that are willing to do this to experience the successes of those younger or more talented but at a middle age level. Thanks Sage for posting your CBCs and being transparent. As you seems to suggest this is a way of making an informal passport control available to the public. But that is the problem.. it is informal. What happens when you move back to Ned and your HCT increases? You may become the target of the public who will correlate this increase with EPO use or blood doping. Or if you don’t post a regular hematocrit, then the gap in time will ask questions. I know you are clean, but I think posting your own CBC opens too many cans of worms. To the person who suggested elites post their CBCs, again, this is an informal way to evaluate who is doping and can make to casually accuse a runner if they have a slightly elevated HCT. Also if a runner posts a normal CBC (elite or not) once a year, does this mean their clean? Of course not.. it means nothing IMO. Regarding cost of doping, there are plenty of cheap ways to cheat besides EPO. I write prescriptions for patients’ legitimate medical use of prednisone, albuterol inhalers, and thyroid medications on a regular almost daily basis. Cheap effective doping drugs are easy to get if you ask around or know a friend with asthma, hypothyroid, or “low T” (I don’t write for testosterone in emergency medicine). Looking at the doping infractions list, it seems that versions of steroids (cheap and easy to get.. you can get anything, including EPO online) are the most common offenses internationally. So, you can be living in your van or parent’s basement and dope. Thanks for your input Dave. I agree, a basic CBC shows nothing. I don’t want to give people a false sense of security…i just want to get the discussion going and be as transparent as possible. I wish there were more ways to prove I was clean (besides my word). I’m willing to take that risk (and aggressively promote for a clean sport on social media) though because i’ve already been accused of doping just based on how I was running in a race! If people see how training on Strava goes (with recovery days and me being super tired some days) maybe that’s another more accurate picture. I feel like to stay silent and ignore the issue would be a mistake. Finally, what you said about “cheap and easy” PEDs totally makes sense. There are tons of things people could be on that (In my opinion) could drastically improve performance in ultras besides just EPO. For sure steroids and testosterone – and even technically DHEA at the grocery store in the vitamin aisle.